The Teddy Bears to the Rescue charity team building activityis an incredible and uplifting charity team building experience with an opportunity for everyone to shine. This gently competitive event is chock full of fun activities that culminate in the creation of snuggly teddy bears that will find a home in the arms of children in special need of the care your group will provide. While teams race to outdo each other during this high-energy charity team building exercise, it soon becomes apparent that everyone is a winner in this heartfelt activity. Teams compete against each other in a whirlwind of fun and exciting challenges and activities. In the process, they earn points that they can use to acquire materials to design their very own teddy bear, complete with hats, shoes, clothes and accessories. Creativity is a key element in Teddy Bears to the Rescue, and teams will be rewarded for the level of detail and care that they put into their bears, as they eventually come head-to-head with one another in Quixote Consulting’s bear-off competition. Awards will be given for several different categories, but there will only be one bear that is “Best in Show.” Which team will have what it takes to build the best bear and win this coveted title? Along with the teddy bears, teams will also have the opportunity to create a special card and even record a special message that will accompany these furry friends to their new homes – the arms of children who have recently suffered a traumatic experience such as an accident or fire. 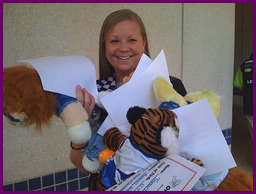 In this build a bear charity team building activity, your group will discover that a little kindness can go a long way! Get ready for smiles all around as everyone pitches in to spread warmth and kindness to children in need. Teddy Bears to the Rescue! The Teddy Bears to the Rescue build a bear charity team building activity can include a debrief by a trained facilitator. The debrief will center on new discoveries about your team, and celebration of successes and can be customized for your group goals. Approximately two to three hours. The Teddy Bears to the Rescue build a bear charity team building activitycan also be the culmination of a full day of Team Quest teambuilding or incorporated into a day or multi-day program using work-style assessments such as MBTI or StrengthsFinder.